We all woke up at 4:30 so we could catch our flight that was at 7:30. We drove to the airport and I was kinda nervous since I haven't flown on a plane in many years. So Kent and I head in and go through security. I managed to take in a bottle of water without them even realizing it, and I felt like a pro going through. Annyyywayy, we chill for a little bit before we begin boarding, but then we start getting on the plane. I think the whole process of boarding is the stupidest thing ever! We let the people who pay the most on first, but then we (the cheaper people) have to walk all the way to the back with all of our crap and bump into all the people who are already seated! I am not bitter. I promise. The flight was uneventful. I sat by the window and Kent sat beside me. We were just chillin' and listening to music, and enjoying the wonderful view of the sky from our window. The plane landed and we got off and sat in Denver, waiting. Denver is a very, very large airport, with many, many people inside. By then it was around 8 or 9, and we chilled, waiting for our next flight. We hopped on our next flight, but this time Kent and I weren't sitting by each other. We were both in the middle of our rows and it was so strange. I really don't like sitting by strangers because then you have to talk to them, and it gets really awkward because you don't know what to say. There is only so much you can say about where you're from, where you're going, and what you're doing there. That flight was 3 1/2 hours and it was so boring! I couldn't stand reading because we hit some bumps and I got kinda queasy. So I just sat and listened to general conference. We landed and our family friends that we were staying with called me. There was confusion about where we were, but we eventually went around full circle and found them. We arrived at their house and ate some food (aahhh. southern cooking) and went bowling! Naturally, we had the boys versus girls set up, but we totally crushed them. Just kidding, we were more tied, but it was so much fun! 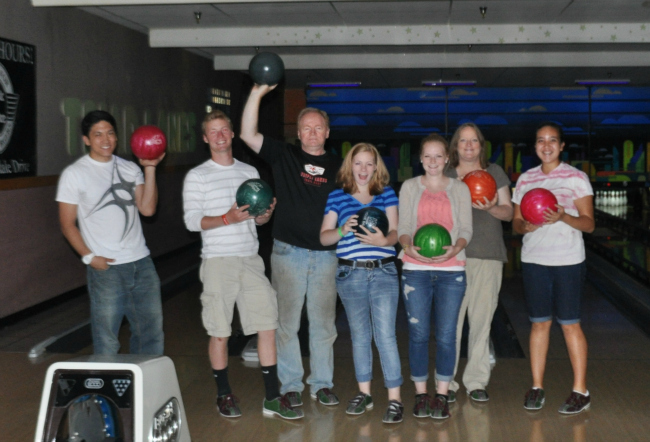 Almost all of us had the bumpers on, so it was exciting to see how everyone used that to their advantage. In one of the games, Kent got four strikes in a row! Now, let me back up a second. After we landed and started going home, I began to have this really weird feeling that I knew where we were, but I didn't. You know? I remembered the trees, some of the streets, and some landmarks. I mean, I remember Biscuitville, Harris Teeter, and Triad Lanes. But I do not remember CookOut. Or Cheerwine. Since I didn't remember what on earth CookOut was, we went there around 11:00 and got some absolutely delicious shakes. We enjoyed those while playing Blitz until the middle of the night. The game got pretty heated and competitive, but we all know who the real winner was here! I woke up to the smell of bacon and went for a run. The sun was coming up, but the trees covered the street and so it was nice and shaded where I was running.. I had forgotten how humid and awful the moisture was in the air, and was drenched in sweat after the first couple of blocks that I ran. Thank goodness I had directions because I would have been so lost without them! I wanted to give up and take a shortcut home, but I didn't want to get even more lost, so I carried on. The breakfast that was waiting for me consisted of apple pancakes, bacon, and cheesy eggs (my faveee). It was quite possibly the best breakfast that I've ever had in the south. But then again, I can't really remember much of what happened before we moved. The children of the household got ready to hit Goodwill up. That is one of the things that I miss the most about the south. In Utah, we had the DI, and that's cool and all, but Goodwill just has a different atmosphere and experience that you can't even explain. 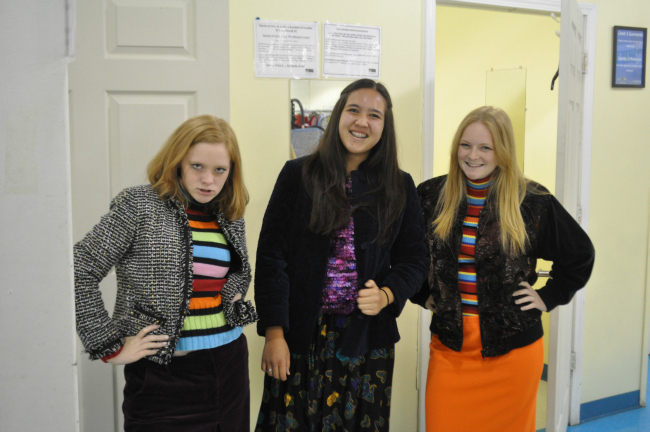 We started by looking around and just laughing at all the wacky clothes that they have stuffed on the racks. We then concocted a game in which us girls picked out the craziest clothes that we could for the guys to try on, and vice versa. It was hard to narrow down the options of what to wear because it is just that. crazy. 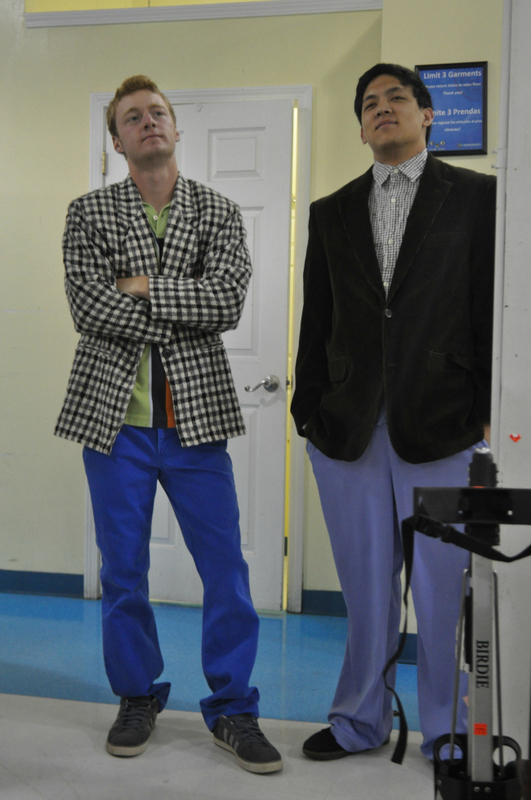 After enjoying that game, we headed to a new thrift store in which we genuinely looked for clothes. Kent and I got Pete a tie that had whales on it, just like the ones he used to draw in 9th grade. It was perfect! Kent and I split ways from the others and visited some other family friends! We were totally lost in trying to get there. And having all three kids from their family trying to tell us where to go was absolutely confusing. We walked in on them watching a man smashing watermelons with his face. It was so disturbing, but you couldn't look away because of how ridiculous it was. It was crazy. We also watched a man stick 14 quarters up his nose, a man burp for a minute, and a guy rip off the tops of soda bottles with his teeth. After enjoying that show for about an hour, we headed out to get a bite to eat. 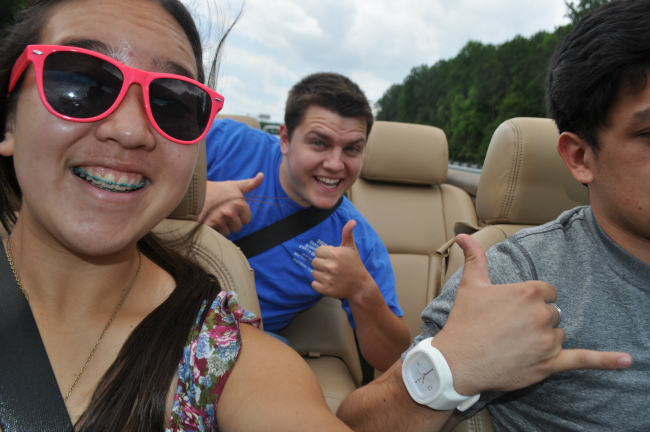 Our friends had let us take their convertible around to visit our friends and it was so much fun. We were blasting Earth Wind and Fire, Lynard Skynard, and more classic songs while flying down the freeway. I was wondering what people thought about us since we looked like some teenage hooligans, but I didn't care! We arrived at Harris Teeter. aka, the best place ever! We used to get subs from the deli all the freaking time. They called their sandwiches footlongs, but in reality, they were about a foot and a half. And they tasted SO GOOD! 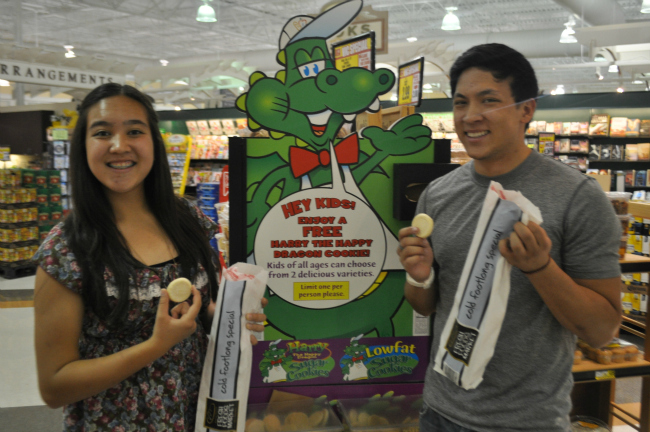 We picked up some subs and got half a dozen free cookies from the Harry the Dragon. You are only supposed to take one, but since we have been gone for three years, we deserved to break the rules a little bit. 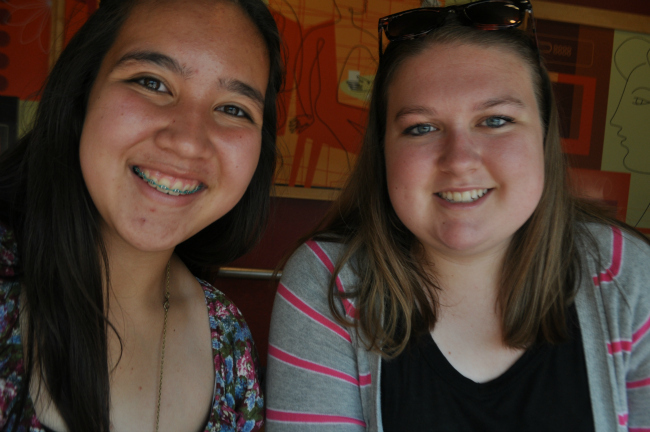 After a lovely lunch, I went to Jamba Juice with my gorgeous friend Bridgette. We talked about everything, just like old times. We were really crazy together, back in the day, and so we talked about how everyone was at school, what has been going on in our lives since we last saw each other, and more. 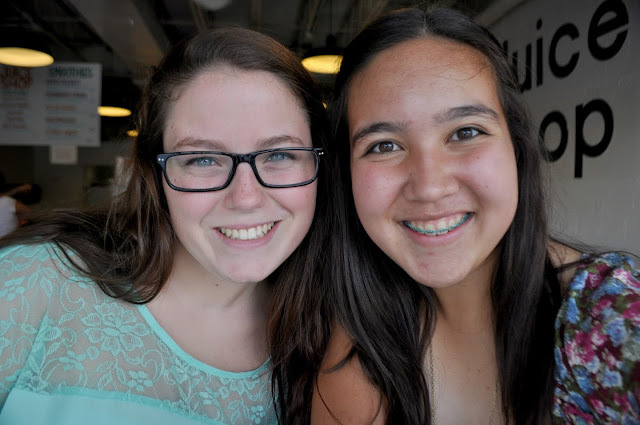 It was so awesome to see her, even if it was only for an hour. After being dropped off by Bridgette, I was picked up by Kaitlyn to go to Starbucks! We enjoyed some extremely hot drinks while sweating in the heat. Don't ask me why we ordered what we did, but it was so delicious! We also talked about everything. It just felt so crazy that I hadn't seen her in three years. We were so close before we left because we lived in the same neighborhood. And before that, I met her because her mom was my fourth grade teacher. I guess it was meant to be that we would be friends! 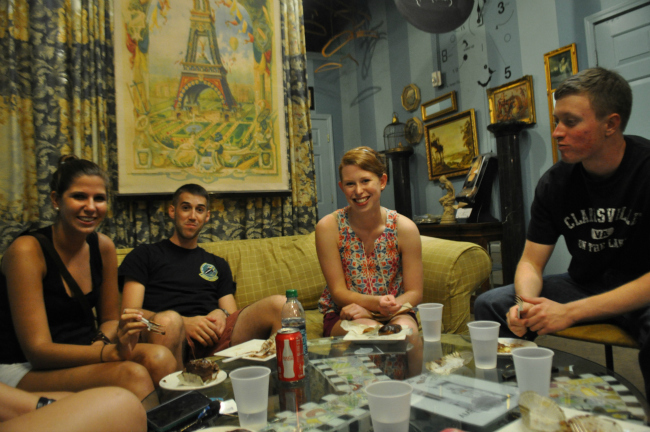 That evening, there was a birthday dinner for one of the missionaries in town. 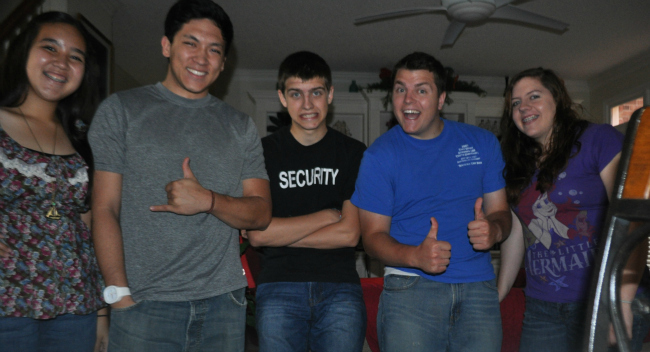 It was so much fun to just be able to relax and have fun with real live missionaries! We don't have those in Utah. Or we do, but we just don't ever get to see them. The meal included enchiladas, tacos, a seven layered cake, and a pinata full of candy. 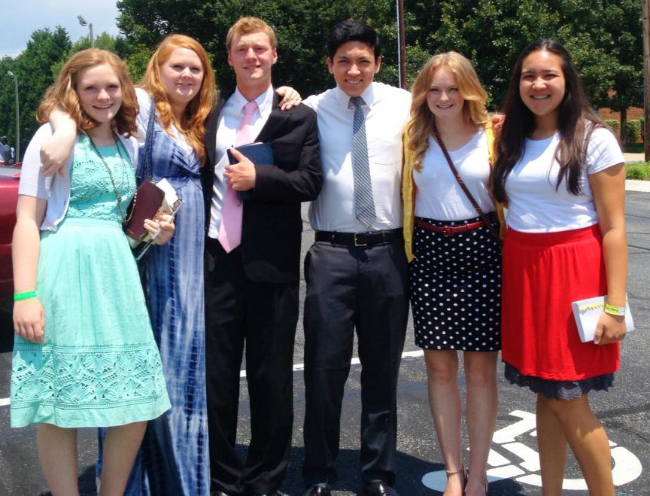 I have to say that it was the most exciting missionary birthday party that I have ever witnessed. And maybe the only one that I've ever seen, but that's beside the point. After the party, the girls all went to a trampoline park to jump around for a while. We jumped and jumped and jumped and became extremely exhausted after about 20 minutes. We left, and got some cheerwine and went to bed. We woke up and had breakfast. 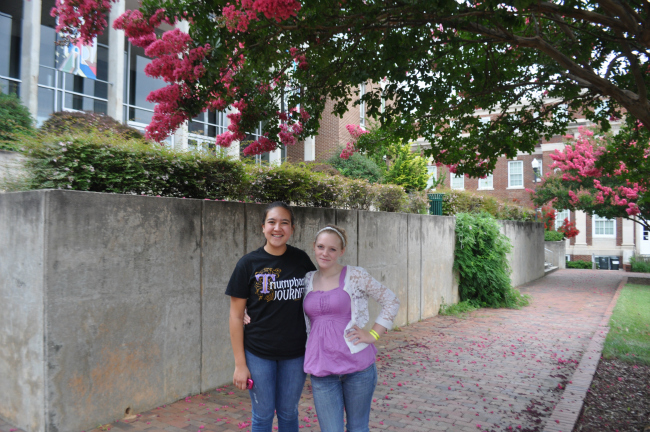 Sophie girl and I went over to take some pictures at UNCG that was just half an hour away. We wandered around snapping pictures and just having a good time until Kent and I had to leave. It was weird to adjust to the environment that had so many trees, but it was so much fun! Kent and I got picked up by some of Kent's friends and we started our journey to see Peter. We were in the car just talking and having a good time and then rain started pouring down! It was coming down so so hard, and everyone was slowing down on the freeway. We were behind a semi and they started to hydroplane and the truck started to turn. It was absolutely terrifying, but thankfully they corrected and it was okay. 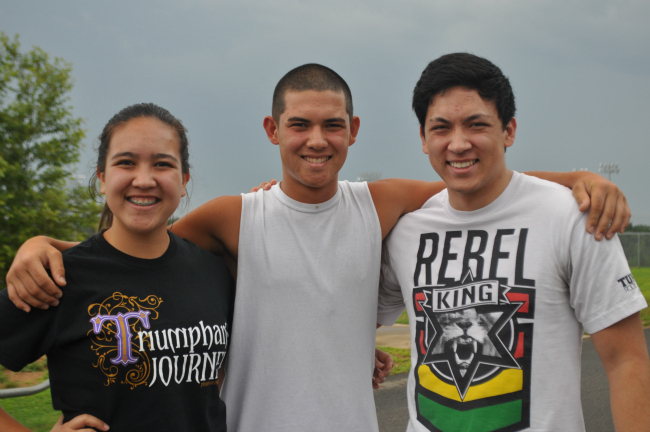 The rain kept coming, but it eventually let up when we got to the high school where they were practicing. Alright, back up. 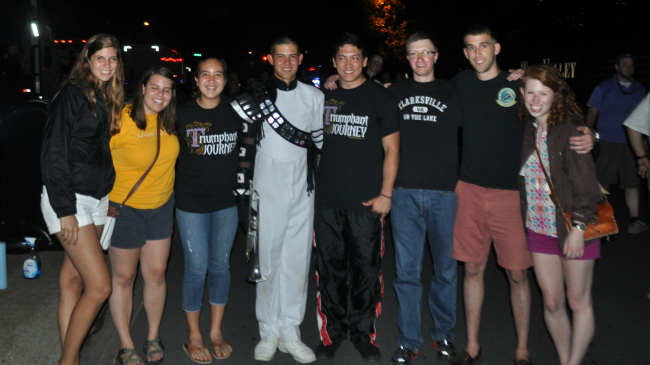 So we went to North Carolina so we could see Peter who is part of the drum corps called Phantom Regiment. 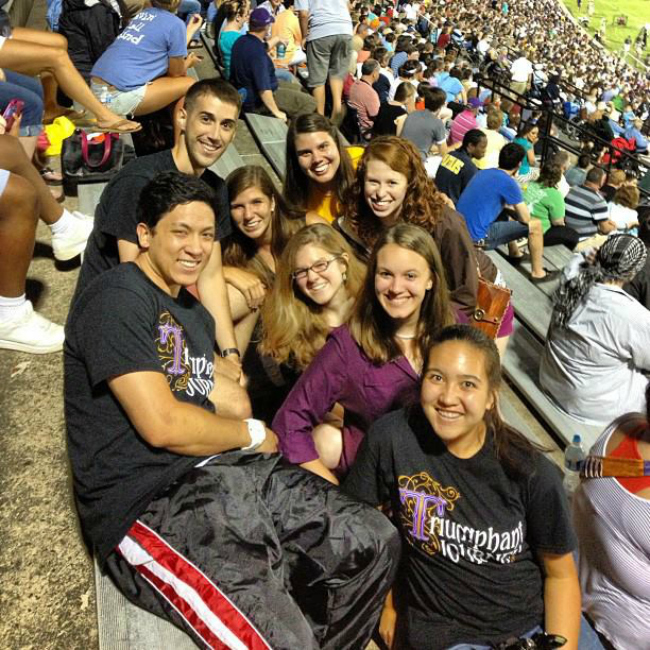 They tour all around the United States performing in competitions with other drum corps like themselves. He has been gone since the end of May, so we have been missing him pretty bad! We managed to keep this whole trip a secret so he didn't know that we were coming to visit him. So we got to the high school. It was me and my brother's old high school buddies. Obviously I was the youngest, but they are so awesome and totally let me into their little friend circle and made me feel at home! We went and searched for where they were practicing, so we loitered about the high school for a bit. Since it was raining earlier, they moved their rehearsal to inside so we couldn't see them practice, which made us all super bummed! We had to wait an extra 30 minutes until his food break to surprise him. It was finally time for their dinner break. We were peeking around the corner of the school and searching for Pete. We finally found him and he was going to the water station. Kent and I go on each side of him and he doesn't even notice. Kent says, "Sun's out, gun's out, right?" and Peter gives a nod of approval without looking up. 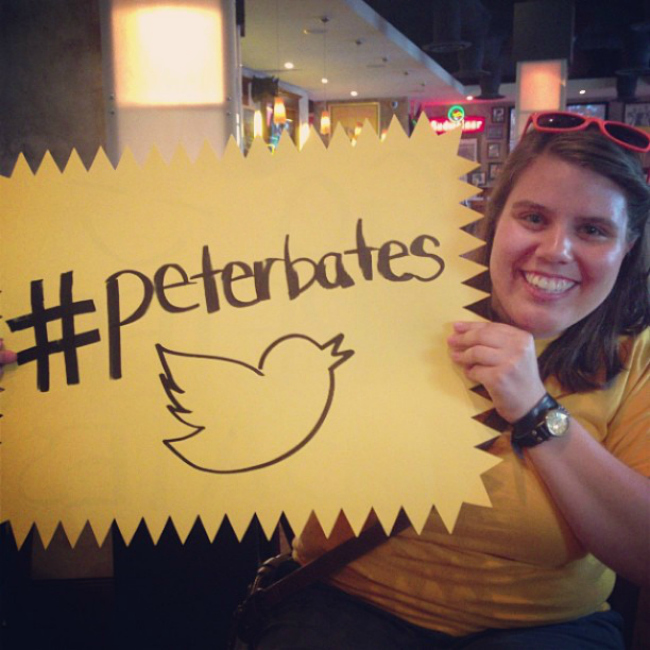 I then say, "Hey Pete!" and he kind of does a double take, and then he gives me a hug. He was so surprised! He gave me a huge hug, and then Kent as well. Then all of Kent's friends came from around the corner and he just looked overwhelmed from all the people! He genuinely did not expect to see anything out of the ordinary. We finally had to say goodbye after talking to him for a little while so he could get ready for his performance. The next stop was the hotel that we were staying in. I was staying with the girl part of Kent's posse, and he was staying with the guys. We hit Target to get some signs and raincoats, and headed over to a sandwich joint where the signs were made. Parking for the competition was hectic. We had to walk 3 blocks to get there, but it was so worth it! Kent and I were going to watch Phantom warm up, but they wouldn't let us back in if we left, so we just sat down instead. We had kinda crappy seats, but it doesn't even matter! We were able to watch the shows and it was amazing. Start using it, people. It will be big someday. 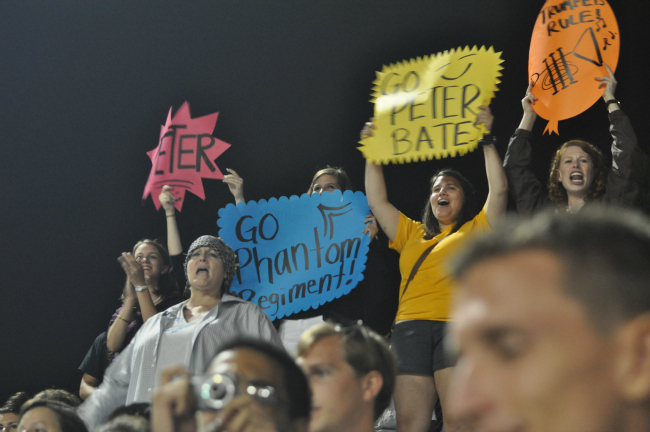 Pete had quite the fan section for this competition! He said he could see the colors from the signs and heard all the yelling of his name! Hearing that made me so excited because I know how it feels to hear your name being called when you're performing. And it's pretty dang cool. I managed to take photos of him the whole show by following where he went on the field. It was so hard to keep my hands in the same position and keep the camera stable for the whole show. My arms were shaking and I'm pretty sure my face was red because of how hard I was clutching my camera! 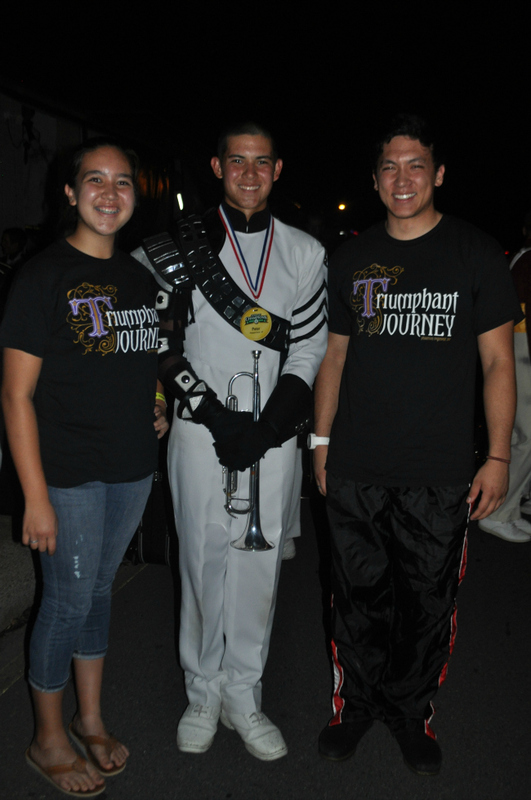 But I got so many pictures (300+) of him marching in the show, so it was worth it! When they finished performing, we ran back to where their tour buses were and waited for him to come back. He looked so good in his uniform! They are so sharp looking. We got to talk for 30-45 minutes until he had to leave again. It was crazy that we saw him and then it was over so fast. 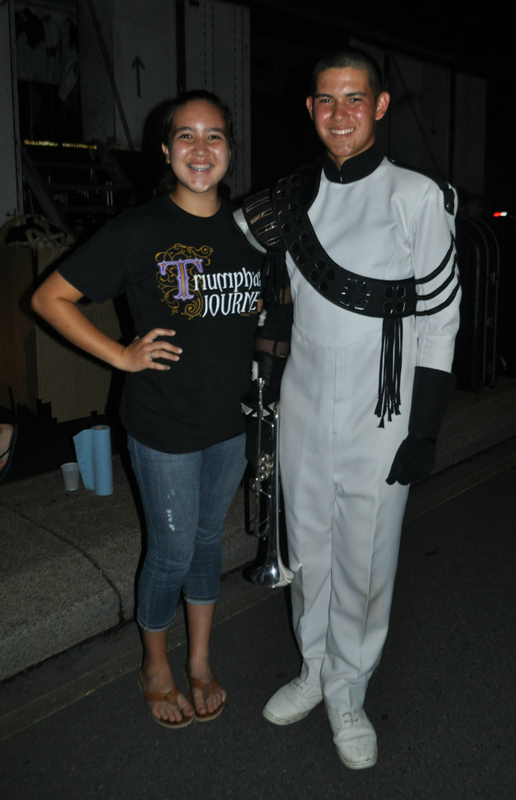 He showed us where he sat on the bus and his cool Phantom Regiment jacket. In return, we gave him candy that we smuggled into the competition. We had to leave Peter, but we went to a 24 hour bakery. It was 11:30 at night and it was their busiest time! The line was overflowing into two more rooms, but it was so worth it. The food was absolutely delicious and the atmosphere was really cool. It was like a France-themed place, but it didn't have anything that necessarily went together. It was just so chill and fun. We stayed there until 12:30 or 1:00ish, and went back to our hotel. At the hotel, all the guys came into our room and we played games until 2:30. It got pretty heated and we were SO loud, but nobody complained. I think that since Beyonce was in concert that night too, nobody could hear anything in the hotel anyway. The games we played were Taboo and Anomia. Anomia gets really competitive really fast, and so we were shouting and yelling and just creating a ruckus. It was so much fun though! We didn't get to sleep until 3:00 or 3:30 because we were all talking. We woke up at 8:00 to have the continental breakfast at the hotel. They had packets of instant grits that I thought was so funny because you can only find that in the south! And they had biscuits and gravy which is my favorite! It was such a good meal for a hotel! We started heading back so Kent and I could go to church. 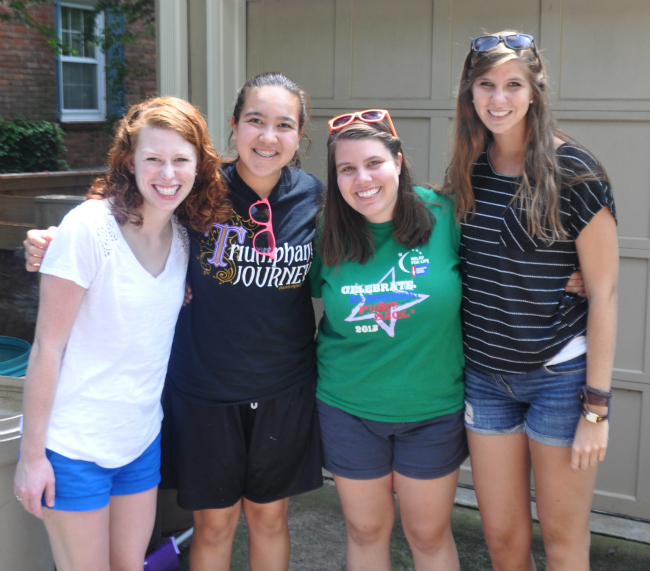 It was so sad to have to say bye to them again, but it was so much fun to stay with them! 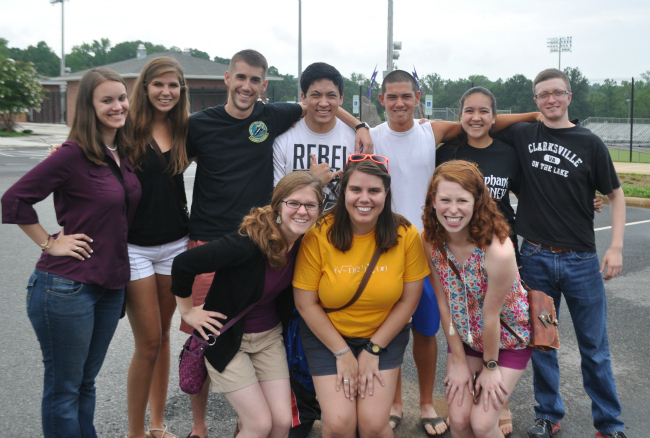 I don't think I could've chosen a better group of people to spend the day with! We departed ways and walked into the house that we were staying at. We walked into an oncoming fire of nerf bullets. They had totally ambushed us and attacked us! It was crazy and Kent and I were scrambling for cover. Church came and we went and saw all these people that we remembered. I would walk down the hallway and someone would start talking to me or ask me who I was. It was strange because I looked so different three years ago that some people didn't even recognize me! It was so much fun though. 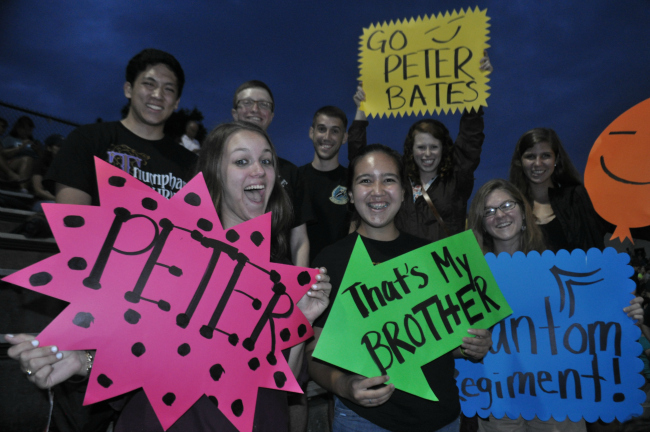 It was crazy fun to see everyone! 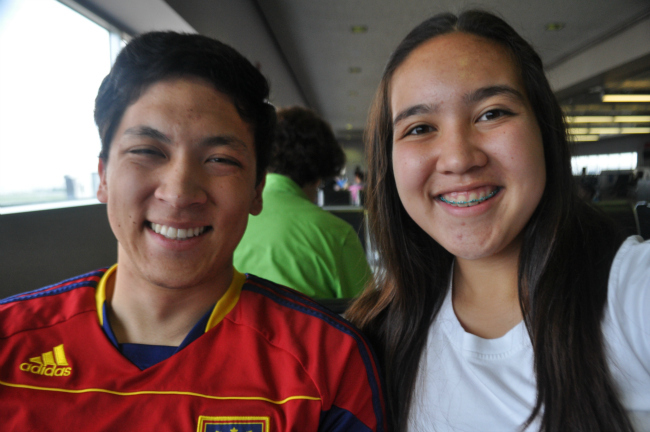 We went through security, and then we were off on a whirlwind of plane rides to get home. This trip was so much exciting and so exhausting, but oh so much fun! I have to say that I will remember this for the rest of my life. All I can think about is how grateful I am for the mountains, dry air, and familiar places that now reside in Utah. But I would love to go back again.